To protect your privacy as much as legally possible. (In other words, in all cases except a legal subpoena.) 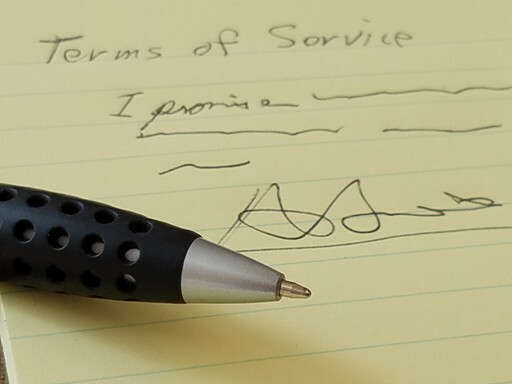 We will use your personal contact information only for billing, service announcements, and for other communications that you have previously agreed to. If we need to look at your personal data for any other reason, such as support, we will ask your permission first. You will be referred to by your publicly available avatar name where possible. To respect intellectual property by promptly taking down infringing content (via the DMCA process) and by asking for permission before using users' content in marketing materials or in any other way other than what's required for normal grid operations. To make sure to give adequate notice, if ever we were to shut down the grid permanently, so that you can make backups of all legally exportable content and get a refund of any money owed to you by the grid. Currency cash-outs or transfers are not the responsibility of the grid and would need to be undertaken with the relevant money provider – typically Podex. Not to harass, flame, abuse, make derogatory remarks, or engage in other methods of harassment to any other person on Discovery Grid in any way, shape or form. To respect maturity ratings by rezzing only appropriate content and engaging in appropriate behaviors. Illegal behavior will not be tolerated and may result in being reported to appropriate authorities. To respect the privacy of fellow users. This means, but is not limited to, not revealing any real life information about another person. That when you create an avatar account, you will provide true and accurate information asked by the registration process, that the account name is not offensive, and does not demean or infringe. That you will provide a true and contactable email for grid communication and country residency. That when you upload your content to our grid, or create new content on the Discovery Grid platform, that we have your permission to distribute that content to other users per your specifications. This allows you to have other users see your content, and enables you to sell or transfer your content in-world. That we can transfer these rights to new owners if we sell the entire grid so that the new owners can continue to offer the same services without interruption. That we are only asking for the rights to use your content as part of the virtual world - you retain all the copyrights to the original content. That we can shut down your account at any time. No child avatars are permitted. If your avatar is deemed to have an immature or otherwise under-aged appearance you may be asked to change your avatar's appearance. When you purchase a region from Discovery Grid you are leasing server space for a given amount of virtual space, prim equivalents, and the services to support the region. Your first monthly tier payment is due upon purchase (it is part of the purchase process). Thereafter, you agree to pay a monthly tier which is due on one of four billing cycles. The billing cycles are on the 1st, 8th, 15th and 22nd of the month. The 2nd payment is due the next month, but it will be moved to the billing cycle on or after the date the region is created. Thereafter your tier is due the same day of each month. For example, if your region was purchased on the 5th of the month and we created it on the 7th, the next tier will be billed on the 8th of the following month. If your region was created on the 24th of the month the next tier will become due on the 1st of the following month. The automated billing system will send your avatar a courtesy reminder instant message 4 days before the bill is due. If you are not online when the message is sent, the reminder is sent to your avatar account's email address. Note that you always are responsible to pay your tier on time even if the reminder does not get to you. If your bill is overdue by 3 days, you will be sent an overdue reminder notice. If the bill is overdue by 7 days, your region will be shut down but not removed. However, it will not be accessible until the overdue tier payment has been made. Paying the overdue tier will start your region. None of your region content is lost or returned. If your bill is overdue by 14 days or greater, your region will be archived, removed from the grid, and its contents saved in the region backups for the duration of the backup cycle, which is presently 45 days. You can have your region recreated and its contents restored by paying a restoration fee and the original late tier fee. We cannot guarantee the region will be placed in the same location if another region has been placed there in the interim. Should you choose to relinquish owning a region, login in to the WEB site, notify us via a support ticket. Give us the region name and the termination date. Please do so at least 7 days before the next billing cycle. Altough there are no refunds given, partial or otherwise for the month, any unused prepaid region tier credits will be refunded. When you log into the grid via any method, you agree to all the above TOS.